← Ta DA!! New Banner!! If 1 toad cost you RM0.30, how much will 3 toads cost? What is that whitish thingie that the finger and stick is pointing at? It’s not super huge “hingus”/runny booger or spit that has been zoom-ed in. No prize for guessing the correct answer. This is just for fun!! Come guess guess. Those that are present on that day please dont bocor rahsia first ya!! 4 Responses to Guess! Guess!! Guess!! 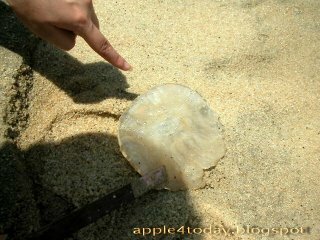 read read then belah d la..
the picture is belahan of jelly fish~! !